There's a good deal of groundbreaking new ST software being written in Europe—West Germany, England and Hungary, just to name a few countries. This makes perfect sense when you consider that the ST was officially released in Europe before the USA, and that European programmers had already gotten a head start programming the 68000 chip contained in the ST when Sinclair released its ill-fated, 68000-based QL computer several years ago. The QL vanished into the mists of computer history, but the ST has been a success story since it's release, especially in Europe and the UK. Some of these innovative European programs are beginning to appear in the USA at last, and Eidersoft is responsible for marketing many of them. One of these is Tempus, a product of Creative Computer Design in Eltville, West Germany. First things first—what Tempus isn't: It isn't a word processor. It lacks some of the necessary functions to be a full-fledged word processor, such as "word-wrap." Each line must be entered separately, and ended with a RETURN, just as if you were using a typewriter. With most word processors, you just keep typing without hitting RETURN; the program takes care of keeping your text nicely formatted, on the screen and on the printer. 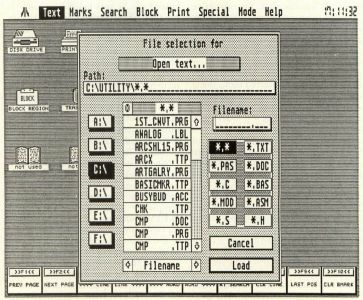 Also, Tempus' printer output is rudimentary at best; although you can create a printer configuration file, there just aren't as many options as a true word processor would normally allow. For example, there is no explicit support for boldface type, italics or different character sizes, although you can imbed printer control codes in your text to achieve these effects. Now that we know what it isn't, here's what Tempus is—fast! The program employs a full GEM interface, the equal of 1st Word's (actually, better), but this baby really flies! Quite simply, Tempus is the fastest text editor I've ever seen, far faster than any current ST text editor or word processor. It's text output keeps up with the most talented touch-typist with ease. Scrolling through a document is so quick, either with the mouse or with the function keys, that you have to watch very carefully or you'll overshoot. But Tempus is not only fast at displaying the text onscreen—it also is amazingly speedy at loading files, and at searching for words or strings of text. Tempus is designed primarily for use by programmers (in any language), and has many features specifically aimed at making editing source code easier. It is fully compatible with the Megamax C and Personal Pascal development shells, and should work with most other shells and CLI interfaces that allow the running of GEM programs. According to the manual, CCD spent over a year developing the program, which is written entirely in assembly language for maximum performance and compactness. Tempus has lots of other nice features besides its speed, too. You can load up to four documents at once, each in its own GEM (actually, pseudo-GEM) window, and move the windows, resize them or close them. The program can load fonts created with the DEGAS font editor for screen display (not for the printer, unfortunately). You can set up to five "marks" in a document and instantly jump to any of them with a mouse click. You can define up to 20 function key macros, for commonly typed words and strings of text, and save them to disk so they'll load automatically when you run Tempus. Tab spacing can be adjusted to suit your preferences. Any ST character (from ASCII 0 to 255) can be entered into a document. In high-resolution monochrome, each window can display either normal-sized text, or half-height text to see twice as many lines in the window. Tempus has a comprehensive set of block functions that can be accessed with either keyboard or mouse, like block move, delete and copy. Blocks of text can also be saved to disk and merged into other documents, or sent to the printer. There is a help menu available, in case you're confused about something. And in several weeks of working with the program, I haven't managed to make it crash once (something I wish I could say about certain other ST programs which shall remain nameless). 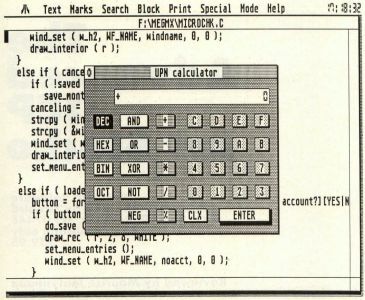 Tempus even includes a Reverse Polish Notation calculator, which for some inexplicable reason is called a "UPN Calculator" in the program, even though the manual has the initials correct. The calculator can be very helpful, precisely at the time when you need it most. . .during text editing. However, the Tempus calculator is not the best one I've seen for the ST; the screen display bears no resemblance to the arrangement of the keys on the ST's numeric keypad. Also, the RPN method may be confusing to people who are accustomed to the traditional pocket calculator. Fortunately, you can easily install one of the many commercial or public-domain desk-accessory calculators if you wish; desk accessories are fully supported by Tempus. When loading or saving documents, Tempus uses a customized file selector, not the normal GEM item selector that we've all come to know and love/hate. The Tempus file selector has every feature of its GEM counterpart, along with some extra capabilities that make it much easier to use. Drives are selected by clicking on a button, instead of by editing the directory line. Much more information is available about the files displayed; you can show the size and time/date stamp of each file as well as its name. A list of standard filename extensions is provided as well, such as .BAS, .S, .ASM, .C, .PAS, etc. Tempus doesn't use real GEM windows, either, although they look and behave almost exactly alike. As with the file selector, Tempus windows are fully compatible with GEM windows. . .but with some improvements. The slider bars and scroll arrows are auto-repeating; in other words, you may click and hold the mouse button on them to scroll horizontally or vertically through the text without repeated button presses. 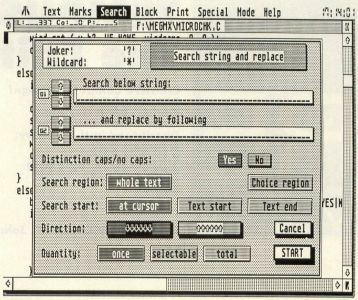 The top line of each window displays the name of its associated document, just as in 1st Word or any other GEM editor, but it also can display information about the current cursor location. And of course, everything about the Tempus windows works at an order of magnitude faster than standard GEM windows. In fact, when you exit Tempus back to the GEM desktop, the feeling is somewhat akin to stepping off a fast escalator. It will give you an appreciation for how slow GEM really is, and how quick it could be. The search routines are very flexible, allowing backward or forward searches with the option to ignore upper/lowercase differences. Up to 20 strings may be entered and remembered by the program for subsequent searches. Searches can be limited to a specified region or include the whole text. Search strings can include wildcards that stand for any character. And did I mention that the search routines are fast? The only deficiency in Tempus' search capabilities is that it can't search for a string of text that extends across more than one line. One of Tempus' nicest features is the ability to create a cross-reference list from a group of strings. The strings are entered into the Search dialog box, with up to 20 allowed. When you choose Cross Reference List from the drop-down menu, Tempus will generate a file which includes the line numbers where each string appears in your document, a very handy tool for programmers. But Tempus takes this concept a step farther. The cross-reference list can be loaded into its own window. Then, if you make the document window active and the cross-reference window inactive, you can click with the right mouse button on the line numbers in the list, and the cursor in the document window will instantly jump to that line, ready to start making changes! This is an extremely well-thought-out feature, and can be especially useful to programmers at those times when their compiler/assembler spits out a list of errors categorized by line number. All Tempus commands can be entered either with the mouse or the keyboard. A slight drawback is that the key combinations used for the commands are rather cryptic and arbitrary. For example, CTRL-C to page down, CTRL-L to search, or CTRL-Y to delete a line. This is a minor point; it's just a matter of learning and becoming accustomed to the keys used. (Although if you've used EMACS, there's a potential "gotcha" lurking here. In EMACS, CTRL-Y is used to restore a deleted line!) Unfortunately, function key macros can only contain strings of text, not commands, and so this reduces their usefulness as a substitute for Tempus key commands. The 83-page Tempus manual is translated from German, and rather poorly; mangled grammar abounds. However, the manual is professionally laid out, and it's reasonably complete except for the lack of an index. All the details of Tempus' operation are covered adequately, with illustrations to help explain the main screens and dialog boxes. The manual comes packaged in a small gray, two-ring binder. Tempus is not copy-protected, and it may be freely copied to any disk, even a hard disk or RAM disk. Instead of physical copy-protection, Tempus makes you go through an installation process before you can use the program, by running the included INSTALL.PRG. This program asks you to input your name and address, and then (I presume) writes this info along with your disk's serial number into TEMPUS.PRG. After this is done, INSTALL.PRG wipes itself from the Tempus master disk. Although this "registration" method has obvious advantages for the user (no need to constantly keep swapping a key disk), I had a serious problem when I ran INSTALL.PRG. I followed the instructions for running INSTALL.PRG scrupulously, finished entering my name and address, and clicked on the box labelled "Input Done." The disk spun for a moment, then I exited back to the desktop. Everything seemed fine. . .INSTALL.PRG was gone from the disk, but the manual said that would happen. I ran Tempus and loaded a text file, made some changes to it (thinking, Wow, this thing is fast! ), and then tried to save the edited file. Lo and behold, a dialog box popped up with the message, "Uninstalled demo version." Something had gone wrong in the installation process, and I ended up with a copy of Tempus that was unable to save or print files. In short, a useless copy of Tempus. And since INSTALL.PRG had deleted itself from the master disk, there was no way to try again! To make matters even worse, after attempting to save my text file with this "demo version," Tempus destroyed my original file, leaving me with a file of zero length. Luckily, I had a backup of my file; otherwise I might have been very peeved. At that point, there was no recourse except to send the disk back to Eidersoft and get a new copy, which worked fine. I have no idea what went wrong with my first attempt at installation, but you'd be well-advised to be cautious the first time you use Tempus. To sum up, Tempus is an impressive achievement—a program which uses the GEM metaphor to its fullest, without sacrificing speed. Even running on a Mega ST4 with blitter chip enabled, no other text editor comes close to the performance of Tempus. And here's something to look forward to: The manual slates that a full-featured word processor based on Tempus is currently in the works. I, for one, can't wait!